Gear Motor School - Motor Manufacturing Companies in India, Induction Motor, Three Phase Motor, Squirrel Cage Induction Motor, Electric Motor, VFD, Roller Table Motors, Crane Duty Motors, Hoist Duty Motors, Prime Mover, Speed Variation Motor. Gear motors are such units in which the prime mover(electric motor) and the speed reduction unit (gear box) are joined together, so that they make a single compact unit. Among many advantages, this arrangement saves a lot of space as it dispenses with the use" of an intermediate coupling, and also as it allows the motor shaft to protrude inside the gear box. The motor and the gear box may be separate and then bolted together for compactness. Or, the electrical and the mechanical components may be enclosed in a common housing. For quietness of operation, high speed-reduction ratio and for shaft axes at right angles to each other, worm-type reduction unit is normally used. This can be of double reduction type if very low speeds are envisaged. For intermediate speed reduction range, Inline shaft or parallel shaft type speed reducers are used. For power transmission at angular shafts, Bevel gear motors are used. For large speed reductions where economy and compactness are the design criteria, the planetary gearings are employed. Standard worm, spur, helical and other type of gear boxes are manufactured by firm specialised in the field. These firms offer catalogues and other relevant technical literature giving detailed information concerning their product range as well as the data to help select the right types and sizes of gear boxes for the service conditions in question. For selecting the correct type and size of the gear box, the following data concerning both the prime mover and the driven machine are essential. A gear box is classified according to its size, rated power, maximum torque capacity, maximum speed, reduction ratio, input and output speeds, and dimensional constraints, if any. To facilitate systematic selection of the correct gear box commensurate with the operating conditions, the following guidelines in the form of steps are given. Calculate the actual power required for driving the machine at the desired speed. Determine the type of load (U, M, H or HI) which is likely to be encountered by the driven machine during service. Depending upon the prime mover, duration of service and type of load. Select the right size of the gear box from the manufacturers' catalogues, so that the rated power of the gear box selected is equal to or greater than the calculated equivalent power for the given speed ratio of the gear box. Gears transfer rotational motion accurately between two shafts and can increase/decrease torque while decreasing/increasing shaft rotational speed, respectively. Gearboxes are combinations of multiple sets of gears which can achieve higher gear ratios in more reasonably sized and feasibly produced sizes, than if just one gear stage were employed. 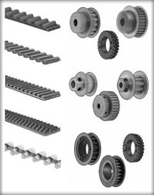 There are many different types of gears which allow the engineer to achieve different ends. Again, many of the images below are from a wikipedia article on gearing. This is the typical hob-cut, simple gear external gear. Axes must be parallel for these types of gears since the teeth are parallel to the shaft axis; and they exhibit noise if running in high speed applications because the teeth do not engage gradually. 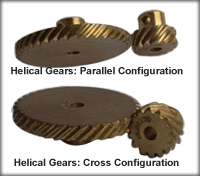 Helical gears, while being more complex to make than spur gears, are much better suited for high-speed applications since the teeth engage more gradually than spur gears. Spur gears engage instantaneously along a line across the whole tooth, but helical gears engage at a point, develop into a line of contact, then separate at a single point of contact. This causes less noise / mechanical shock in the tooth. The tooth shape of a helical gear is a segment of a helix, and their shaft axes can be oriented at any angle, though the contact area tends to be optimal when the shafts are parallel . Thrust is generated along the shaft axis in helical gears, which has to be counteracted with thrust, taper, or spherical bearings. Double helicals (also known as "herringbone" gears) prevent the problem of axial thrust which is present in helical gears. However, they are even more complex to manufacture. Bevel gears consist of two conically profiled gears (in cross-section) whose hypothetical vertices intersect. Teeth can be straight-cut or spiral-cut (which are analagous in functionality to straight hob-cut spur gears and helical gears). Similar to bevel gears except the shaft axes do not lie in the same plane. Worm gears function similar to leadscrews. 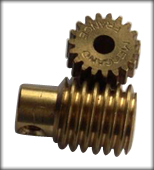 The worm can always drive the gear, but they can be designed such that the gear cannot backdrive the worm. When the teeth on the periphery of a helical or straight-cut gear are instead placed along a single line instead of the circumference of a circle, a "rack and pinion" is formed. In this way, finite linear motion can be achieved directly from a rotating gear. 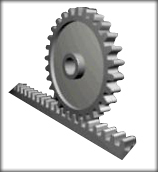 Gears can be paired to create "epicyclic" gear sets, in which one or more of the gear axes rotates during gearing operation. By fixing one or more sets of these axes, different output gear ratios can be obtained. And this is the principle and type of gearing in the modern automotive gearbox transmission (a great interactive illustration, in which various axes can be held fixed by the user). Belts & pulleys (and cables) / chain & sprockets transfer force and motion from one shaft to another, and similar to gears, they can increase/decrease torque while decreasing/increasing rotational speed respectively. 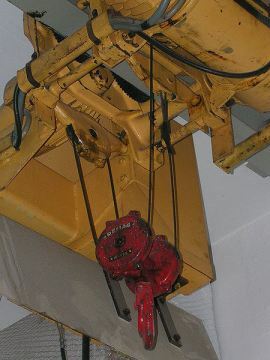 Pulleys combined with a non-toothed belt or cable, such as a V-belt, provide a useful method of transferring power where an approximate (but not absolute) ratio of input speed to output speed is necessary. Timing belts are pulleys with teeth features on the belt and pulley, which provide a much more exacting ratio of input-to-output rotational speed. Of course, compound pulleys (a "block and tackle" arrangement) can be used to magnify mechanical force-trading off the distance a load is moved for the amount of force applied to it. Timing chains and sprockets are more expensive, (can be) noisier than belting, and require lubrication, but they can transfer more power within a given space and have a direct and exact ratio of input-to-output shaft speed. They also require exacting location of the shafts.